Your Source for great puzzles, games, brainteasers, puzzle books, jigsaws, and blacksmith puzzles. Calling all land barons and property magnates! Here is your chance to gather-up more of the city than your opponent. 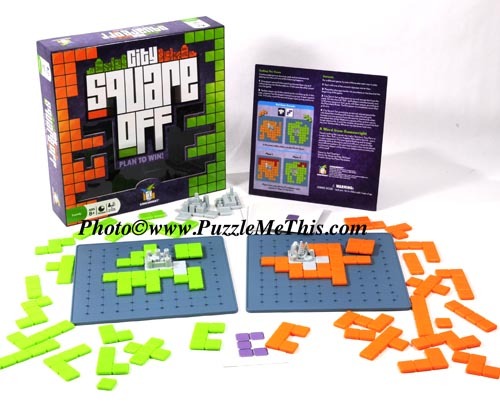 This clever match-up game was introduced by Gamewright Company in 2011. Each player has their own city grid. 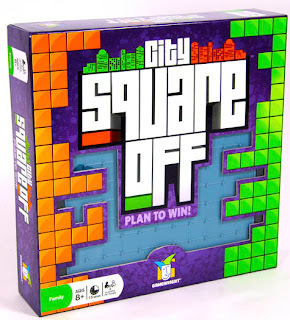 On each turn both players must set the exact same size piece on their city grid. Each player starts with a duplicate set of identical pieces. The excitement starts as players can choose whichever position they desire to play a piece. 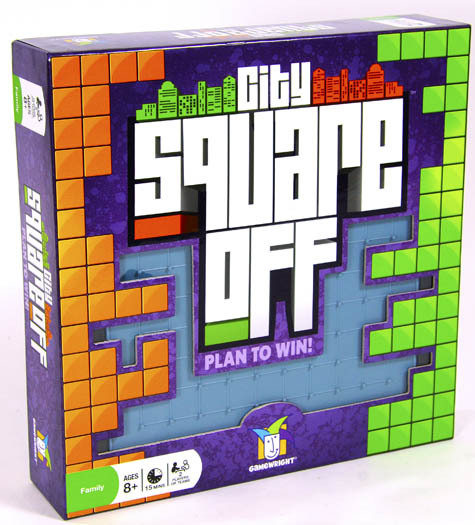 Foresight and planning are the key to success in City Square Off Game. As space on your square gets filled up there will be less places to fit-in additional buildings. Player with the fewest remaining un-played pieces wins. Very easy to learn, exceptionally engaging game for two players. You'll notice some resemblance to Blokus Game and Cathedral Game. The play in City Square Off is substantially different. We are often asked our opinion on the best new puzzle for a given season. 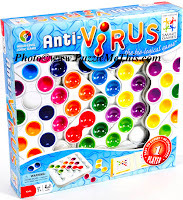 Our best recommendation for 2011 is Anti-Virus Bio-Logical Brain Teaser. 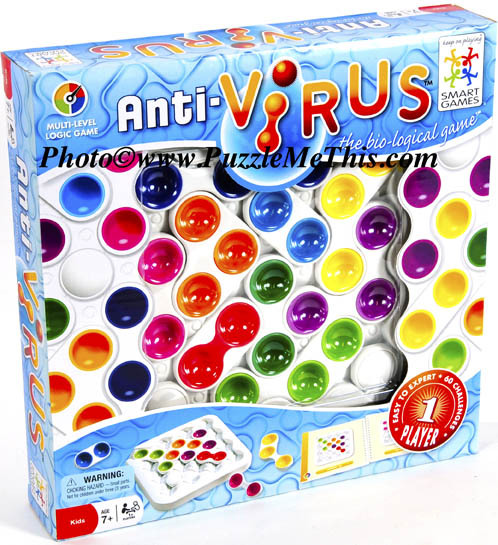 Anti-Virus puzzle has an insidious virus that has infected your game board. Players need to discover a way to remove the double RED nasty virus from the grid by sliding the other harmless puzzle pieces around the game. Clever game design and shape of the virus pieces allows them to easily move in four diagonal directions. Colorful, provocative, 60 puzzles, with 5 levels of ascending difficulty. Great for ages 8 to 137 years. There are enough challenges here to keep the average player puzzling for weeks, maybe even months. Like the challenge of the Rubik's Cube ? 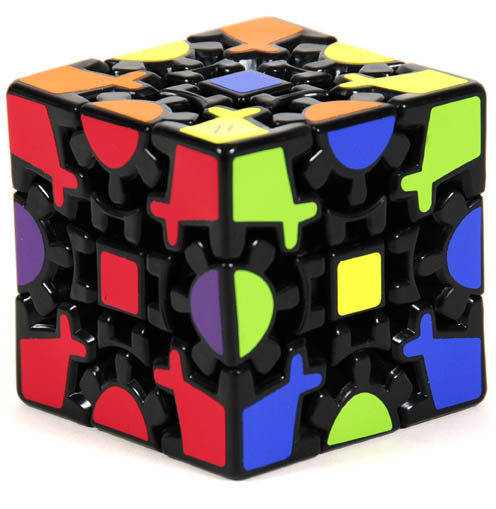 Along comes an all new rotational style Puzzle called the Gear Cube. 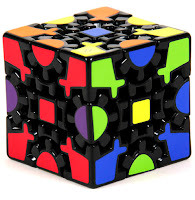 The puzzle pieces form a solid square similar to the rubik's cube. However once one turns the sides you see the pieces move in a much more strange way. The pieces are attached to a series of internal gears. Gear Cube turns it into a very odd shape when it is mixed up. Mix up the puzzle by rotating the sides many, many times. 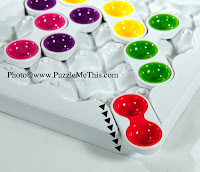 The objective is to bring the puzzle back to ALL one color on each side. (same objective as the original Rubik's cube.) The design of Meffert's Gear Cube is very intriguing. 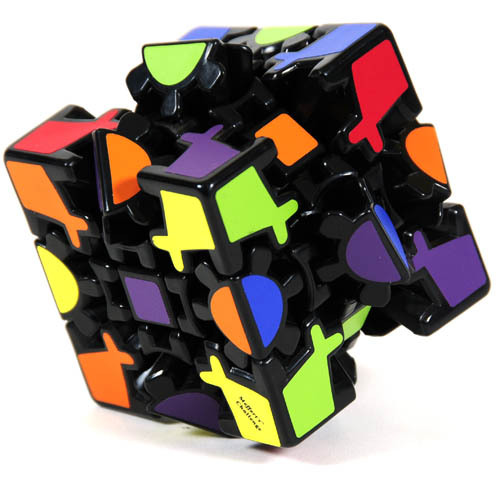 The challenge is similar in difficulty to Rubik's Cube. The gears travel smoothly. Recommended for ages 10 and older. 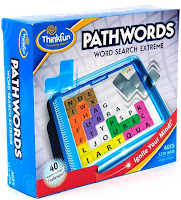 Words lovers as well as challenge seekers are sure to enjoy the puzzles presented with Think Fun's new 2011 puzzle called "Pathwords." Puzzlers are presented a grid of what appears to be random letters. Use selected color pieces when you find a word to cover the letters. Each grid may have three to eight words with no remaining letters. Search up, down, left, right (not diagonal) to identify words. Forty puzzle challenges are grouped into four ascending levels of difficulty. Each page in the manual represents a new puzzle. Pathwords is very well designed. The colorful jelly shaped tetris pieces feel wonderful. The case has a sliding top. Pieces and manual store inside. The playing surface has smooth indentations which match the tetris shaped pieces; effectively keeping them positioned over words you discover. 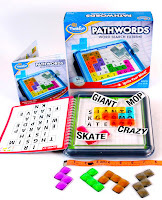 Pathwords gets a A+ for physical design and an A+ for the puzzle style. Recommended for ages 12 to 137 years. 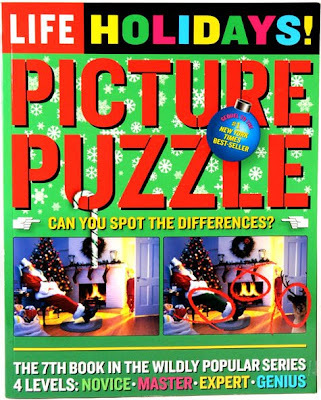 From Life Publishing comes HOLIDAY Picture Puzzles: Can You Spot the Differences? How keen is your vision. On each page puzzlers are presented two almost identical photographs. Thanks to the miracle of photo editing software one of the images has been altered in several very subtle ways. As you scan back and forth between the two photos see if you can determine what is different. Puzzles are rated with ascending difficulty levels. Total number of changes is indicated with small check-off boxes. Some are readily spotted (like different colored pants on Santa Claus). Other differences are tricky to find. In all cases Picture Puzzles: Spot the Differences are fun-filled activity for all ages between 7 to 137 years. Settlers of Catan Deluxe Dice Game players use their gold dice rolls to trade for sheep, lumber, wool, grain or brick. Settlers of Catan Board Game has become a phenomenally successful and probably the most well-received adventure roll playing game over the past several years. Now comes along a streamlined version of the game. 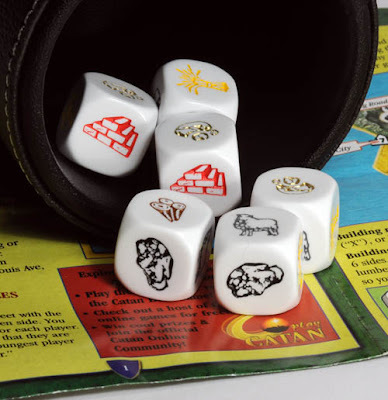 It is played with specially designed and embossed dice. On each turn players have the opportunity to roll six dice up to three times. Between rolls some dice may be set (i.e.kept in place with no further opportunity to roll). Use combinations of dice to build roads, settlements and cities. For example a settlement requires 1 each of lumber, brick, sheep and grain. 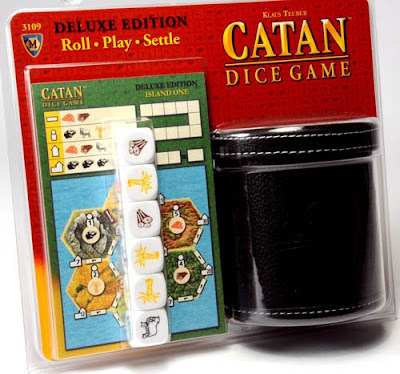 Settlers of Catan Deluxe Dice Game is an very clever game which can be enjoyed by ages 8 to 137 years. So if you are the type of person who is a little adventurous with new game choices (and who does not stay with the standard unos, monopolies, yahtzees, pictionaries) then we highly recommend Settlers of Catan Deluxe Dice Game. And we suspect that after playing the dice version a few times you will look forward to playing the full board game with all its various enhancements. Bananagrams the crossword creation game has taken off with phenomenal success over the past 3 years. For fans of this game comes Bananagrams! the Official Book. Word devotees will delight with this compilation of word themed puzzles, word brain teasers, and all around fun with the English language. Bananagrams the book has a variety of puzzles to pique the curiosity and challenge the skill of word lovers. If you play the tile game you will learn several great techniques for improving your game. Try Banana Trees, where the object is to build word grids based on a theme. Or Banana Splits, a collection of four quick anagram puzzles to be solved in rapid-fire style. Or Banana Filling - what happens when you add a 'K"? Bananagrams Book is a great way to keep one's mind sharp, keen and engaged. College and Graduate students will find it a fun and helpful to prepare for language tests. You'll find word puzzles that are different from the actual tests questions, yet still practical for enhancing abilities. 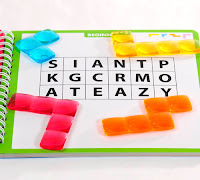 If you are a fan a crosswords, acrostics, jumbles, cryptogram, word search, scrabble maybe it is time to try some new, unusual and stimulating variety of puzzles. 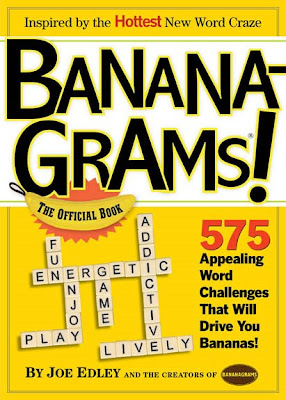 Purchase information for the Banana-Grams Book! Brain Teasers were the main product first sold by Puzzle Me This when it opened as a retail store in Provincetown, Massachusetts in May, 1991. Curently we have a wide array of almost every type of puzzle (jigsaws, rubik's, NYT Crosswords) as well as hundreds of exciting board and card games. One can also find interesting skill toys (like yoyo's, diablo's, juggling) as well as many popular summer fun toys. Provincetown is a quaint fishing village at the very tip of Cape Cod Massachusetts known for its Artist Community, Portuguese Settlers, Whale Watching, Biking Trails, Beaches, Boating, Tourists and myriad of special events. Provincetown is a long narrow stretch of land that curls up at its tip and surrounded by the Atlantic Ocean. It still retains much of its old-fashioned look, despite some gentrification and steep rises in real estate prices over the past 8 years. Puzzle Me This is one of 100 small unique retail businesses that operates along the main street. The stores and restaurants in Provincetown are 99% distinct. There are no national chain businesses in the town. Each business has a strong tendency to reflect its owners.